SRBI stands for Scientific Research-Based Intervention. It is Connecticut's initiative to address the national program RTI, or Response to Intervention. The premise behind these programs is to monitor students throughout the year in order to provide assistance to those who are struggling before they fall behind. To monitor student growth, all students are given benchmark assessments. This data is collected and discussed by educators and then used to decide a student’s placement in SRBI. 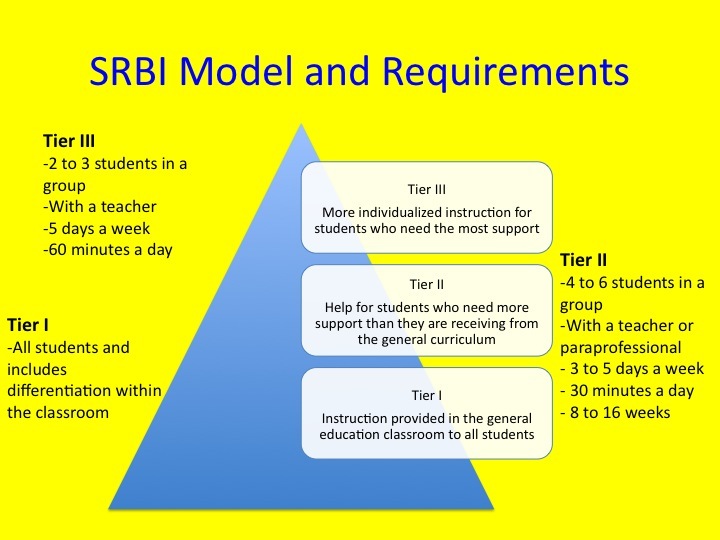 SRBI is a three-tiered model. Tier I is general instruction provided to all students. Tier II provides additional support for students who are struggling. Tier III is individualized interventions to address student needs. All students placed in Tier II or Tier III are monitored closely throughout the year to measure academic growth. The following video is Connecticut Commissioner of Education Mark McMquillian explaining the program. Here is a link to a Parent Guide To SRBI from the State Department of Education. How Does SRBI Work at VES? All students at Voluntown Elementary School are given benchmark assessments three times a year. These assessments include the Developmental Reading Assessment 2, STAR computerized test for reading and math, and the benchmark assessments associated with the grade level curriculum. The data from these assessments is collected, and along with classroom performance, is discussed at Data Team Meetings. At these meetings administrators, teachers, specialists, and interventionists analyze the data and decide where the students will be placed in the SRBI model. This is the model for the Tiers at Voluntown Elementary School.